Cuero has a rich pharmacy history dateing back to the time of its founding. This exhibit is meant to show a bit of the history that was and coninues to be an important part of our lives. Pharmacists are highly-trained and skilled healthcare professionals who perform various roles to ensure optimal health outcomes for their patients. In Cuero as elsewhere many pharmacists are also small-business owners, owning the pharmacy in which they practice. These individuals have played inmportant roles in the growth and development of the City. The history of pharmacy is a long one with some of the earliest recorded prescriptions dating back to the Sumerians around 2,000 B.C. The first known drugstore was opened by Arabian pharmacists in Baghdad in 754 A.D. The first pharmacy in Cuero dates to 1872 when it opened for business as a branch of Reuss Pharmacy located in Indianola. 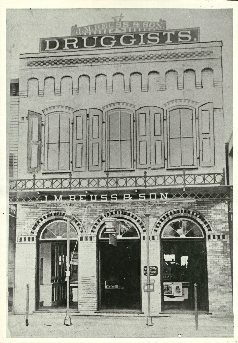 Reuss Pharmacy is the oldest operating drugstore in the state of Texas, having opened in 1845. Early pharmacies were more than a place to get your prescriptions filled. They often served as a social center and a place to take a “date” for an ice cream soda. Like today’s stores, one could purchase a wide variety of items such as the latest Edison phonograph, jewelry, school supplies and tobacco products. The term “soda jerk” originated in the ice cream parlors located inside a drugstore. The name came from the jerking action the server would use on the soda fountain handle when adding the soda water, and not the temperament of the server. As you walk though the various displays you will notice the heavy emphasis on extracts from plants (botanicals). Keep in mind that it was not until around 1860 that the first non-naturally occurring medicines were synthesized. You will also notice that some practices showed a total lack of understanding of human physiology. As an example, patients were often “bled,” either by opening a vein or through the use of leaches, to drain the poison from the body. These practices were done in good faith and were based on the current thinking of the time. Joe Reuss, a life long resident of Cuero and a fourth generation pharmacist, has generously loaned the Museum a small part of his collection of pharmaceutical items. Joe graduated from Texas A & M College with a degree in Industrial Engineering and the University of Texas College of Pharmacy. Joe also is largely responsible for the Cuero Federal Building (the Old Post Office) being transferred to the City for use as a museum and offices of the Chamber of Commerce and Agriculture. Joe has worked tireless for the betterment of our community and currently is active in numerous areas. A couple examples are improvement in Alzheimer patient care, and he also serves as a member of the board for the Cuero Industrial Foundation. To learn more, visit Pharmacy & Medical Museum of Texas at 114 E. Main Street in Cuero. This web site was donated, and is maintained at no cost to CHM, by Integrated Web Solutions.